Ever stop and think about how your average, everyday PC keyboard doesn't have the same satisfying "click" that it used to? 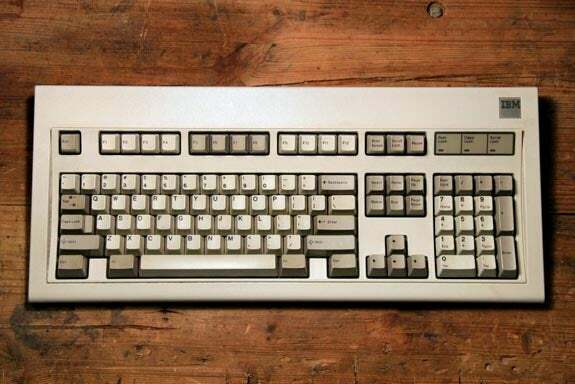 Well, some manufacturers still make mechanical switch keyboards that feel like the classic IBM Model M--and if you spend your work (or play) time typing away on a PC keyboard, it might be worth your while to switch out your membrane keyboard for a mechanical one. Depending on what you use with your PC, a mechanical keyboard could help you type more quickly and more accurately, and it will last far longer than a standard PC pack-in keyboard will. I've been rounding up about a dozen mechanical keyboards for an upcoming PCWorld feature, which means I've spent several weeks playing with some of the best keyboards out there. Here are some of the advantages, disadvantages, and common questions I've encountered over the past month of mechanical keyboarding. A mechanical keyboard uses actual, physical switches underneath the keys to determine when the user has pushed a key. Press a key, and you press its switch down. Press the switch down, and the keyboard sends a signal to the PC telling it that you pressed that key. At first, this design doesn't sound so remarkable. After all, you already have a keyboard, and you can tell when you've pressed a key: You push one down, and a letter pops up on the screen. Take a second, however, to think about how you know you've pressed a key--it's probably because you've pushed the key down as far as it will go, only after which do you see something happen on your PC. Most keyboards are composed of a set of three plastic membranes, with rubber dome-shaped switches underneath each key. Press a key, and the rubber switch pushes through a hole in the middle membrane to connect the top and bottom membranes, which creates an electrical circuit that causes the keyboard to send the input to your PC. This keyboard design is inexpensive and spill-resistant, but it doesn't give you as much tactile or audible feedback when you press a key, which can change the way you type. Over the past week, I've been lucky enough to spend some quality time with a handful of high-end mechanical keyboards, including the Das Keyboard Model S Professional, the Diatec Filco Majestouch Ninja and Majestouch 2 Camouflage, and the SteelSeries 6Gv2 and 7G. Of course, each of these keyboards uses different parts and design elements, and each one has a different build quality, layout, and weight. So I'm going to save the side-by-side comparisons for our upcoming mechanical keyboard review roundup, and instead talk about my overall experiences here. Mechanical keyboards feel very different: I started out by swapping my stock Dell keyboard for the Filco Majestouch Ninja, and the difference between the two was immediately apparent. The Ninja gave me a far more satisfying "thunk" noise when I pressed the keys. It's hard to pinpoint exactly what felt so good about the Ninja, except that when I tried to go back to the Dell keyboard (or any other standard rubber-dome keyboard), it felt mushy. Many laptop aficionados are big fans of Lenovo laptop keyboards because they offer more tactile response than your average laptop keyboard does. Each key requires a certain amount of force to actuate, and the key does not yield until you push down with enough force. Lenovo keyboards feel "crunchy," for lack of a better word. Each keystroke feels more pronounced and intentional on a Lenovo laptop keyboard than it does on a lesser keyboard, and the increased physical feedback from the keyboard lets your brain know when you've pushed each key hard enough that you can move on to the next one. Basically, a good mechanical keyboard is to a standard rubber-dome keyboard what a Lenovo laptop keyboard is to a regular old laptop keyboard. No matter what kind of switch your mechanical keyboard uses, each keystroke simply feels more solid than it does on a normal keyboard. Mechanical keyboards are loud: While the actual volume depends on what kind of switch your keyboard uses, as well as on your typing technique, mechanical keyboards are significantly louder than other kinds of keyboards. Personally, I like the sound--it's an additional form of feedback for each keystroke--but depending on where you're doing your typing, this sound could be a problem. None of my coworkers noticed a significant noise increase after I switched to the mechanical keyboards, but we're often wearing headphones during work anyway. If you're using your keyboard in a room where someone else can hear you type, they may find it distracting. Some PCWorld readers have reported that they can't even talk on Skype with people while they're typing on a mechanical keyboard because it drowns out the voices. I didn't notice this problem, myself--it depends on your microphone setup--but it's certainly something to be aware of. Some mechanical keyboards out there advertise lower sound levels as a selling point--the Razer BlackWidow Ultimate, for instance, has a Stealth Edition that uses different mechanical switches that are supposed to be quieter than most. Stay tuned for our upcoming review roundup for our test results. Mechanical keyboards are heavy: When I pulled the Das Keyboard Model S out of the box, PCWorld's laptops editor Jason Cross commented that it was the kind of keyboard he'd keep on hand in case of a zombie invasion. No joke: These things are heavy--usually about 3 pounds or so. Between the weight and the rubber contact pads on the bottom (which are much bigger than the ones on my Dell keyboard), this thing basically doesn't move from my desk unless I pick it up. And that's nice--I hate it when my keyboard constantly slides around. Obviously, mechanical keyboards aren't designed for portability. Mechanical keyboards last longer: Mechanical switches are certified to last longer than rubber-dome switches pretty much across the board, regardless of the manufacturer. For example, SteelSeries offers both mechanical-switch keyboards and rubber-dome keyboards, and the company's mechanical keyboards (the 6Gv2 and 7G) are both tested for up to 50 million key presses, while its rubber-dome Shift is good for only 15 million--and that's with high-durability switches that last longer than the typical 1 to 5 million presses for most rubber-dome keyboards. So even if a mechanical keyboard costs ten times what a cheap dome-switch keyboard costs, the mechanical one should last long enough to make the investment worthwhile--unless you spill your drink on it, that is. The SteelSeries 6Gv2 mechanical keyboard (and some other gaming gear). Mechanical keyboards (might) make you type differently: Some mechanical keyboard switches (Cherry MX Blue switches, for example) are designed to give you an audible "click" at the point where each button has actuated. That isn't merely meant to annoy your cubicle neighbors--the idea is that you will learn to stop pressing the button down when you hear the click, not when the button can't go down any further. At first, I didn't realize that, and my hands were getting tired much more quickly than they usually do while typing, since I was pressing down each key further than necessary. So I tried consciously using less force to type. It took a little doing, but two weeks later I've noticed that I'm typing more lightly, more easily, and maybe just a little bit more quickly--after all, the shorter the distance that each key travels, the less work for my fingers in the same amount of time. That isn't such a big deal for a light computer user; for me, however, it can mean the difference between leaving work on time to catch the early bus or getting stuck in traffic. You don't need to go out and buy a mechanical keyboard for a light-use family PC or a home theater PC, and you won't want to lug one around for your laptop or tablet. But if you're a PC power user and you're willing to shell out a few hundred dollars on a high-end CPU or graphics card, don't cheap out with a pack-in stock keyboard. You might find that moving up from your old rubber-switch keyboard to a nice mechanical model could make your computing more enjoyable overall. And don't forget to check back soon for our upcoming mechanical keyboard roundup!